Cellulosic biofuels are not as far off as often assumed. 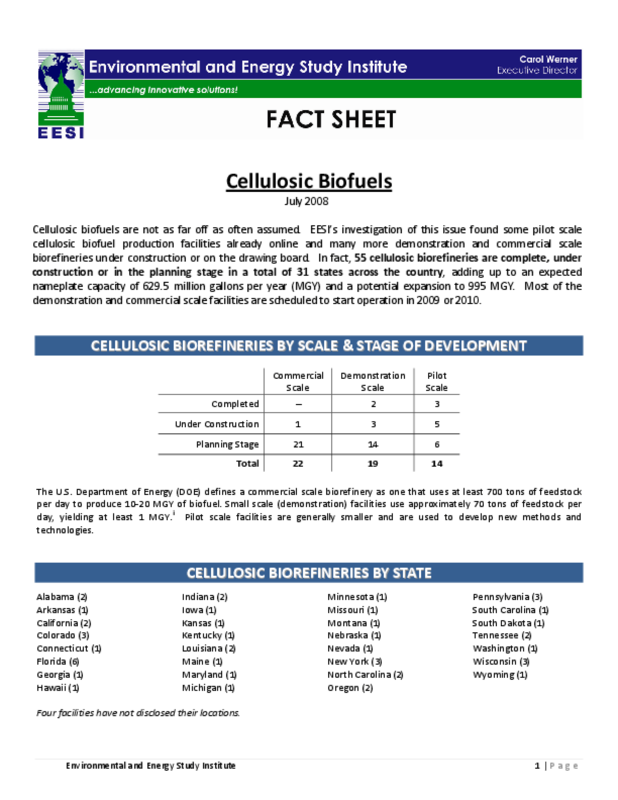 EESI's investigation of this issue found some pilot scale cellulosic biofuel production facilities already online and many more demonstration and commercial scale biorefineries under construction or on the drawing board. In fact, 55 cellulosic biorefineries are complete, under construction or in the planning stage in a total of 31 states across the country, adding up to an expected nameplate capacity of 629.5 million gallons per year (MGY) and a potential expansion to 995 MGY. Most of the demonstration and commercial scale facilities are scheduled to start operation in 2009 or 2010. Copyright 2008 Environmental and Energy Study Institute. All rights reserved.